I'd like to put a shower/toilet combo in this space. At first I thought about gluing pond liner to waterproof the sides/floor, but I don't think it would hold up. Now I'm planning to put a thin sheet of plywood covering the windows and the side walls, then covering it with FRT. Glue it real good and put in some plastic anchors. I know the bend in the roof line will be difficult. I'm going to use a panel from the back of the bus as a template to cut out the side walls. I'm sold on a composting toilet! But I'll still have a grey tank for the shower & sink. Is there a composting toilet that I could 'mount' in a shower pan? Are they made to get wet in a shower? Any other suggestions appreciated too! I do commercial construction and a lot of jobs with a tile in place shower use a spray/roll on waterproofing membrane or use a thick rubber type membrane. Then install the tile bed (sometimes up to 4") (replacing old school technology with new school ideas) then install the tile mortar bed, tile, then grout. They do make an epoxy grout. I didn't like the tile idea because of all the flexing and moving of the bus? To keep a long story short? I had made a tile top table by normal means and it worked and looked beautiful. My parents came from texas to visit and I decided to move the table from in the house to the back porch I had just screened in? Halfway out the door with my dad helping (a little heavy) the table racked and there went half of my first tile job? Long time ago but/and I still don't see tile in a flexible structure? There are means and methods for any idea maybe check out flexible grout or just use some dang gome good silicone. It's your creation and palace so build what your happy with? I wanted to participate in this conversation, request clarifications, and hijack with some of my ideas. So when you say wet bath are you talking about like a wet bathroom? like if I wanted to, I could pee on the floor, dump water on it, and eventually it would drain? Because that's exactly what I want to do in my bathroom. I was hoping someone could provide insight with that. I was thinking of just laying some FRP/some other water proof device/or wood with a lot of water proof treatment over that and have it at an angle so it could drain into the shower drain. (my bathroom I have in mind is about 7 x 3ft). I don't think I understand what you're saying, are you trying to put the composting toilet in the shower? Like so you can sit on it and wash yourself while you shower? How big of a shower pan are you thinking? The skoolie shower already seems a little cramped to throw a toilet in on top of that. I don't know if that makes a lot of sense to me. Especially since composting toilets are pretty pricey. 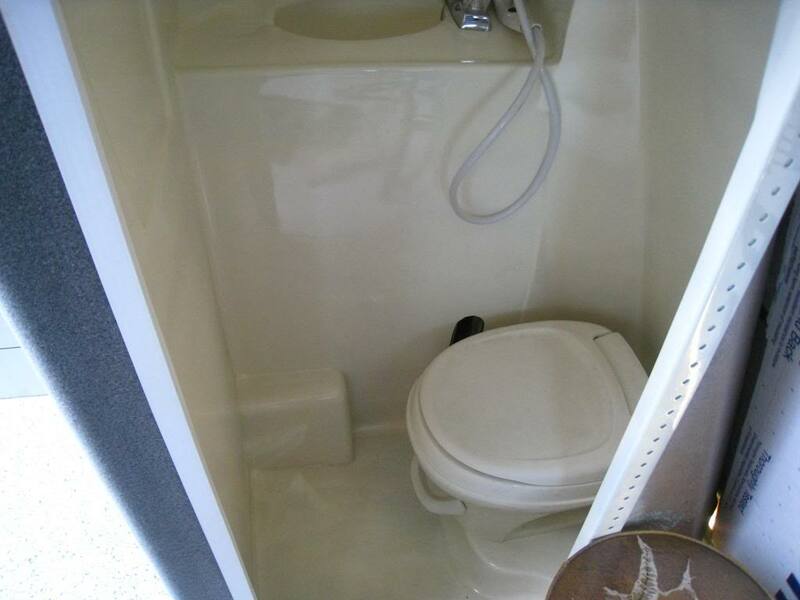 If you're looking for a toilet to use in the shower, I would just make your own composting toilet with a bucket and design it so it can be water proof, then worst case scenario you'll only be out a couple dozen bucks and you can redesign accordingly, rather than losing grand in toiletry. Anyway I'm into the idea of a wet bathroom, so we're in the same book just maybe not the same page. i built a combo shower/shitter in my bus. it has some draw backs, but saves space. for my camping needs, a shower is an overrated, big expense that never really gets used. when you do use it, you gotta move everything out, like tp. installation of the toilet on a slope is something you need to figure out. the shower has an "i dare you to use it" kinda feel to it. i think my shower pan/bathroom is 34" x 48"
if i was to do it over, i'd use tile and a waterproof system called "schluter kerdi". i just installed a hose bib for outside water, and i think that will get used more often for showers than the indoor shower. I too am doing a wet combo with a composting toilet. Right now I am thinking about having a stainless shower pan made up to fit and using FRP on the walls. With metal I can weld attachments for holding the toilet in place without having to puncture the pan. And almost no matter how you slope them, uneven ground generally leaves you with the drain in the wrong spot. Just keep a small squeegee handy. I have a combo-composter/shower, and it works great. 200+ showers with very little if any moisture issues, and I highly recommend it, especially for smaller vehicles. I also agree. They work fine in the same space...but...you do need to keep the "mix" from getting wet as noted above. Mine will have a plastic shower cap over the top when used in the shower mode. Yes, it is going to be a small space. I have about 3ft in width and could go up to 2'6" from the wall. Definitely want to put the toilet & shower in the same space. I think tiles would be too heavy, and would likely crack in cold weather. My biggest concern is what to do with the walls to make them water tight. I'm hoping the FRP panels glued to wood backing and lots of caulk would work?